Muddy Waters, the little boy who came to live with his grandmother in Stovall in 1918 and grew up to be a blues music superstar, died Saturday in Chicago. Waters died of "cardiac arrest" at home in the Chicago suburb of Westmont, said his manager, Scott Cameron. He was pronounced dead at 2:17 a.m. Saturday at Good Samaritan Hospital in suburban Downers Grove, spokeswoman Roberta Butler said. The rotund singer hadn't been ill and had planned to make another album this summer, Cameron said. He had earned six Grammys during his career. Waters was born April 4, 1915, in Rolling Fork. 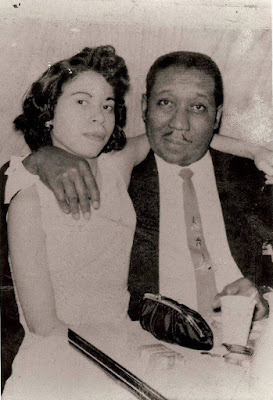 His name was McKinley Morganfield and his father Willie Morganfield was a farmer and musician. After his mother died, he moved in with his grandmother in Stovall. Waters received some schooling locally. He taught himself to play the harmonica at the age of nine and began singing in church choirs in the Clarksdale-Stovall area. Waters worked as a farmer in the area during the 1920s and 1930s. He began playing music in juke joints, picnics, Sunday functions, and local parties around this time. He picked up his nickname in his early days playing at fish fries and other social gatherings along Deer Creek. 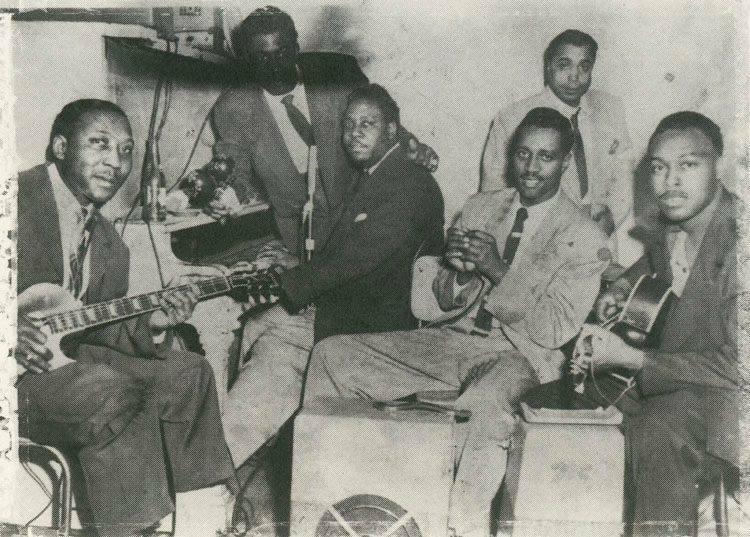 Between 1940 and 1942, Waters was recorded by Alan Lomax of the Library of Congress playing and singing the blues in Stovall. The recording "Down on Stovall Plantation," was the first of many albums by the blues performer which would influence the course of modern music. In 1943 the bluesman moved to Chicago at a time when many Southern blacks were moving to the industrialized North in search of work. By 1948, he had assembled the band that spread the sound of 12-bar, amplified Delta blues to millions of urban blacks and, 15 years later, young white rock musicians and fans around the globe. Waters' classic songs include "Hoochie Coochie Man" "Mannish Boy" "Rollin' and Tumblin'" and "Got My Mojo Working. In 1954 he recorded a song called "Rolling Stone," which would be his most important link to the superstars of today. The song inspired Bob Dylan to write and record "Like a Rollin' Stone." Mick Jagger's English rock band named themselves after the Waters classic. The magazine "Rolling Stone," also took its name from Waters' song. Another English group — The Beatles — were also influenced by Waters' music. His early musical influences included such famed bluesmen as Son House, Charlie Patton and the legendary Robert Johnson. He frequently slid a steel cylinder along the neck of his guitar to evoke the wailing sound of the Mississippi Delta blues. "My feelings toward Muddy is like a father, you know, and my tears have been running," said the blues singer and guitarist Buddy Guy, a Waters protege. "He's the father, one of the fathers of rock." Over the years, Waters' band brought together a constellation of blues stars, including pianists Otis Spann and Sunnyland Slim; guitarists Jimmy Rogers and Buddy Guy ; and harmonica players Little Walter Jacobs, James Cotton, Big Walter Horton and Paul Butter-field. 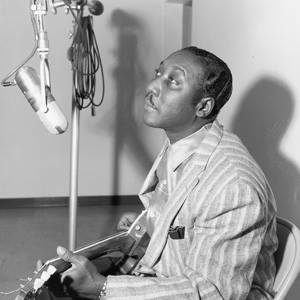 Despite Chicago's position as the mecca of the blues world, and Waters' prominence in that world, he barely earned a living through most of the 1950s. He continued working at a paper mill — the job he took when he arrived in Chicago —and for a radio parts company while at night he played the smoky little clubs that dotted Chicago's South and West sides. Waters finally achieved national acclaim as part of a revival of American folk music, appearing several times at the Newport Jazz Festival in Rhode Island and the Ann Arbor (Mich. ) Blues and Jazz Festival in the early 1960s. The blues underwent a revival on college campuses and across England and Europe in the late 1960s, and white blues-rock guitarists including Eric Clapton and bands such as the Rolling Stones, Led Zeppelin and the Yard-birds found inspiration in Waters' music. Waters "wasn't doing bad recently," Cameron said. "We were not expecting it. He was taking some time off, enjoying the fruits of his labor." His last local appearance was two years ago at the Delta Blues Festival in Greenville. 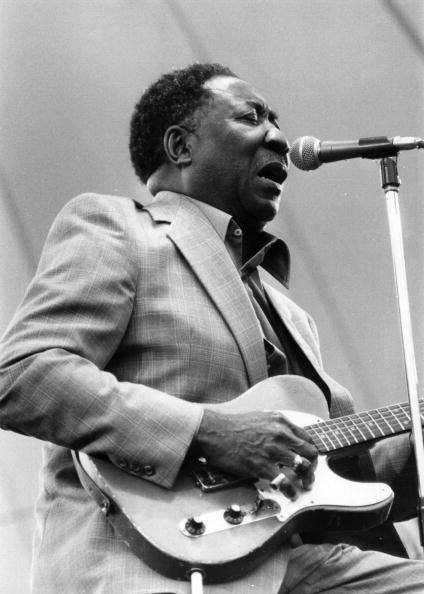 During his performance, which included the unannounced appearance of Johnny Winter, who had recently finished recording an album with the blues legend, Waters introduced his relatives still living in the Clarksdale-Stovall area to the audience. Waters is survived by his wife, Marva, three daughters and a son, four grandchildren and several great-grandchildren. CHICAGO ( AP ) — The waters of Deer Creek, a tributary of the Mississippi River, often washed the back porch of the sharecropper's house in which Muddy Waters was born. And while the blues carried the man around the globe several times, he never forgot that his roots lay in the fertile delta nurtured by the mightiest of American rivers. Waters, the man who plugged an elec-tric guitar into an amplifier, forever changing the course of the blues and charting the beginnings of rock 'n' roll as well, died Saturday of a heart attack. He was 68. "When I sing the blues, it comes from the heart," he told an interviewer several years ago. "From right here in your soul, and if you're singing what you feel. it comes out all over. "It isn't just what you're saying, it pours out of you," he continued. "Sweat running down your face." The second son of sharecropper Willie Morganfield. Waters was born McKinley Morganfield on April 4, 1915 in Rolling Fork, Miss., near Deer Creek. His nickname came from his early days, playing at fish fries and other social gatherings along the creek. As a youngster, he traveled around the black towns that dotted the delta, storing bits and pieces of what he heard in his head. 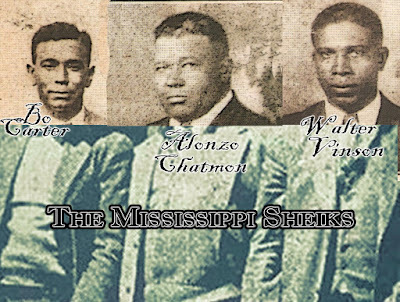 I\‘ Few of the musicians who worked the Mississippi Delta had any formal training or decent instruments. But they carved a niche for themselves by stretching the 12-bar format with such innovative techniques as the bottleneck and bent note to produce a sound that would not be forgotten. The names — Son House, Charlie Patton and even the legendary Robert Johnson — wouldn't mean anything to most Americans for nearly 40 years, not until that trio, along with Waters. gained recognition during a revival of American folk music. One man who knew those names back then, folklorist Alan Lomax, set out in search of Son House in 1941, hoping to persuade the aging bluesman to record for the Library of Congress. But when he came up empty-handed, the locals directed him to Waters, who was then working on a plantation at nearby Stovall. By 1943, Waters joined the wave of poor Southern blacks migrating northward in hopes of finding work in the large, industrialized cities of the Midwest. Within five years, he put together the band that would become the standard against which all blues would be measured. Over the years, a constellation of blues stars moved in and out of his band. Its members included pianists Otis Spann and Sunnyland Slim; guitarists Jimmy Rogers and Buddy Guy; and harmonica players Little Walter Jacobs, James Cotton, Big Walter Horton and Paul Butterfield. But first there was a problem to overcome. We were playing acoustic instruments in a lot of little clubs where the people were so loud you couldn't hear anything," Waters recalled. "So we got the idea of plugging into the electricity. And the people liked that right away.. They'd be dancing and having a good time." But despite Chicago's position as the mecca of the blues world and Waters' prominence in it, he only eked out a living through most of the 1950s. He worked at a paper mill and for a radio parts company, all the while playing the smoky little clubs that dotted Chicago's impoverished black South and West sides. The Chess brothers' takeover of the Aristocrat label for which Waters had been recording, boosted his career, popularizing such classics as "Hoochie Coochie Man," "Sail On," "I'm a Rolling Stone," "I Just Want to Make Love to You" and and "Got My Mojo Working." In 1962, the Rolling Stones rock group named themselves after their hero's song, and his own fortunes were on the rise. Waters rose to national acclaim as part of a revival of American folk music, appearing several times at the Newport (R.I. ) Jazz Festival and the Ann Arbor ( Mich. ) Blues and Jazz Festival through the 1960s. During this period he also performed at New York's Carnegie Hall. The blues underwent a revival on college campuses and across England and Europe in the late 1960s, with white blues-rock guitarists like Eric Clapton and bands like the Rolling Stones. Led Zeppelin and the Yardbirds finding their initial inspiration in Waters' music. Waters became a fixture on the worldwide pop concert circuit, and he continued to turn out albums. In the last five years, Waters' age forced him to curtail what had been a busy and profitable concert schedule. But many of his disciples, notably Guy, Butterfield and Junior Wells, carried on Waters' tradition. His songs appeared routinely in reworked form on rock albums throughout the 1970s. "My feelings toward Muddy is like a father, you know, and my tears have been running," said Guy. "...It makes me sad to think there are few people around like Muddy left. It makes people like Junior and I wish we could have that kind of influence." And Johnny Winter was there sometimes too, often with his huge amplifiers, which banished all desires for dextrous nuance on the guitar to a realm far away, and of course, much quieter.